Trevor Clower is an unpaid carer living in Nottingham. 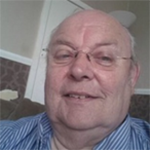 He is very active organising and running 16 Carers Road Shows each year offering free support for all Carers. Trevor is an active campaigner for both carers and people with learning disabilities. It was wonderful to hear that your son has been given the opportunity to work with support from his advocate and members of staff in the garage. Hopefully in the future more people with a learning disability will be given an opportunity to work and make them feel valued. Great experience. We could see how a job changes things in the recent Employable Me programmes on BBC2. The work ethic is just one thing, the social and esteem boosts from work come slowly and later. Shame the DWP don’t read about this and maybe release some of the pressures onn other jobseekers affected by conditions that can affect their learning focus. Thanks for sharing. Glad Scott is enjoying work and hope that soon work will be an option for all who want to work.